In the last few years, the Northeast region has hit the national headlines for reasons ranging from the Armed Forces Special Powers Act to the insurgency problem to illegal migration from Bangladesh to being victims of violence in metropolitan cities due to their culture and lifestyle, Dr Kamei Aphun, the convenor of the programme, said as he explained its objective. 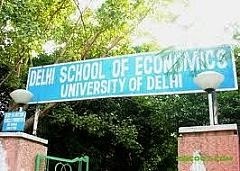 “This programme aims to have exchange with the Northeast, accelerate social science research by attracting the best PhD scholars and leverage the strengths of the department in comparative research along with closely collaborating with other academic and policy-research institutions such as the Asian Dialogue Society, Singapore; Jawaharlal Nehru University, Jamia Millia University, print and digital media. This will be the first such programme in the country,” added Dr Aphun. Appreciating the effort, Robin Hibu, joint commissioner of police and Northeast nodal officer, Delhi police, said, “As a policeman and nodal officer for the Northeast, I feel that such scholarly work should reach out to as large an audience as possible, let your research be available to all, share it with us, policy makers, the youth and give solutions.